Stylish, light-filled and with a delightful mixture of tradition and contemporary design, Dar Finn is well-located in the central medina and sleeps up to 16 people. 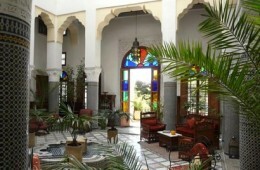 A magnificent house in a convenient location, Riad Idrissy offers great style and privacy. 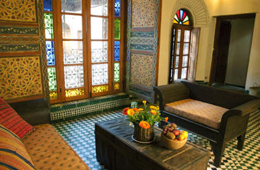 A generously proportioned, luxurious guesthouse in the quiet area of Ziat, Riad Damia has a double and a single room, and seven large suites. 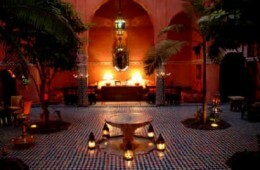 Experience Berber hospitality at Riad Tafilalet near the Bab Jamaï area of the medina. It has one double room and six suites. 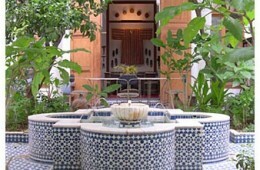 Ryad Mabrouka is an elegant guesthouse with a pretty garden and a swimming pool in a quiet area. It has two double rooms and six suites. 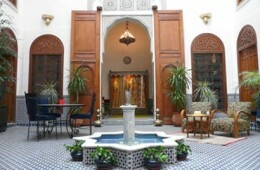 Dar Anebar is an elegant house with a double room and four suites. It has an excellent restaurant that’s open to the public. 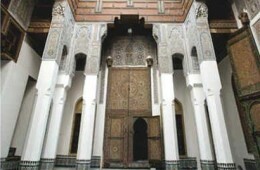 This majestic, ancient house is right in the middle of the medina so close to all the major sites. 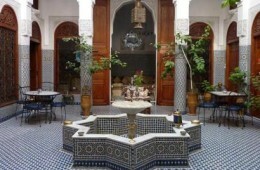 It has a restaurant, hammam, garden and swimming pool. A superb 600-year-old house, Dar Seffarine is a gem. It’s close to Seffarine Square near R’cif. Situated in the popular Douh area near Batha, this pretty guesthouse has a traditional hammam, four suites and two double rooms. 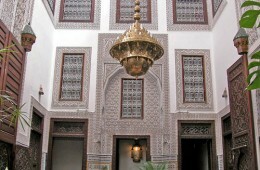 With its leafy courtyard and excellent hospitality and cuisine, this riad is ever-popular. Close to the convenient area of Batha, this luxurious dar (traditional house) has an Andalusian feel and reflects the deeply entwined history of Spain and Morocco. Named for the twenty jasmine bushes that scent the garden air, this elegant house is close to Batha. It’s comfortably and stylishly furnished and has central heating. 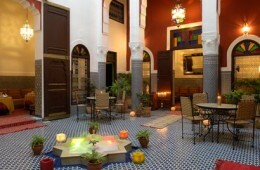 Ryad Salama is a stylish riad in an excellent location that is owned and run by well-known Fez hotelier Michel Trezzy. There are seven suites and a swimming pool. 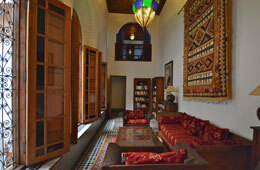 Dar al Safadi is a gracious house near the Glaoui Palace in Ziat. There are six bedrooms, and the owner is known for her superb cuisine. 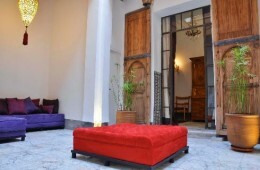 La Maison Maure features contemporary design in a traditional house in a good location in the central medina. 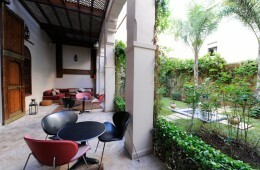 It has a hammam and massage room, and superb terraces. 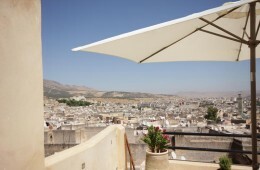 Dar Roumana is a large, airy house with spectacular medina views from the roof terrace. There's an excellent restaurant that’s open to the public.